How do I Import Contacts from CSV File? 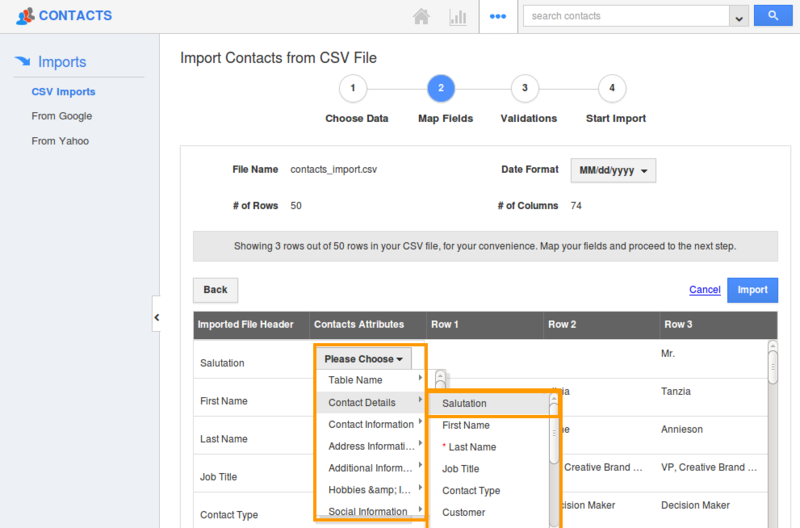 The CRM allows you to import your Contacts into Contacts App in CSV format. At a time you can import 5000 records. This minimizes the manual effort of entering the data. Also the duplicate contacts can be filtered from entering. Log in and access Contacts App from your universal navigation menu bar. Click on "More" icon and select “Import” icon located at the app header bar. Click on "CSV Imports" from left navigation panel and then Click on "Import" button. You can import a New File or Update existing records.Click on "Browse" button and select CSV file from your computer and click on "Next". 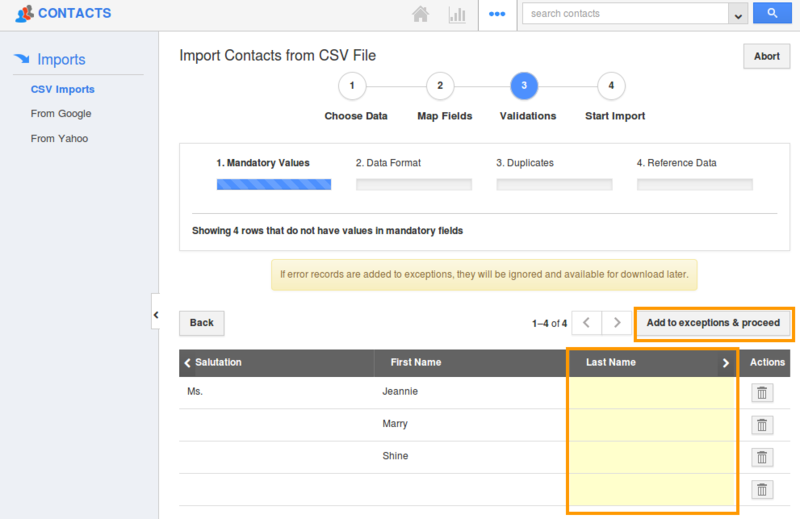 Map contacts fields to respective CSV fields. Make sure to map the custom mandatory fields. 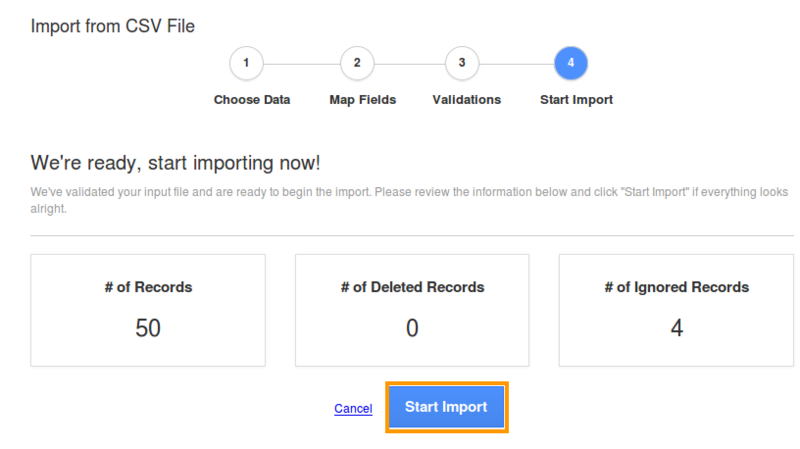 Click on "Import" button to import records. You can view warning popup which alerts you for mapping common fields such as territory, segments etc. In case of mandatory fields not having values, they are added to exceptions. If error records are added to exceptions, they will be ignored and available for download later. If you want to continue click on "Add to exceptions and proceed" button or click on "Back" button to include mandatory fields. Mandatory Values - Validates mandatory value association. 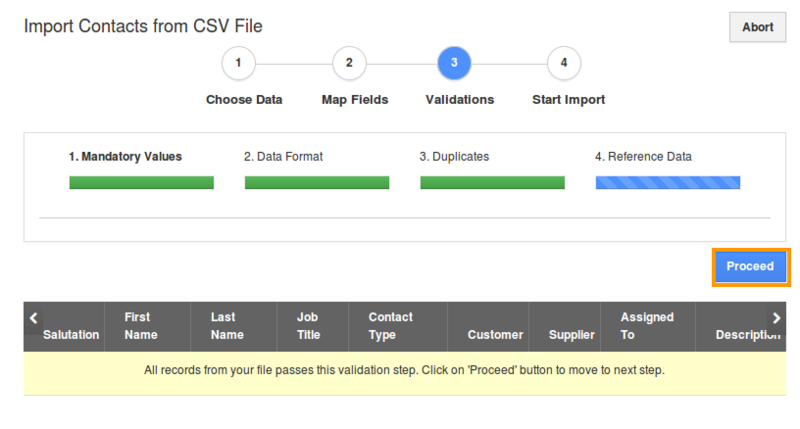 Data Format – Validates data format issues in CSV. Duplicates – Validates duplicates in CSV. Reference data – Validates the association of other objects. This will associate existing objects, if there are new objects found in CSV, you are allowed to create new objects. Click on "Proceed" button for each step. Once the reference data completes, click on “Proceed” button to import records. 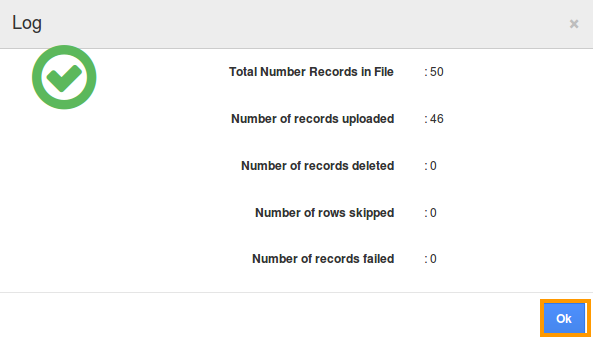 Here we go, the import is done successfully and the log will display the totals of imported records, failed, and etc.